Here is a photograph of a small cross stitch project that I just finished. (As you can see from my blog footer, this prayer is one of my favorites.) I have made this same design several times, always with the intention of keeping it… but somehow I have always ended up giving each one to someone else. I’m pretty sure this time this one is for me! I really enjoy working on any type of embroidery, and especially small projects with counted cross stitching like this one. These framed pictures make a nice “tuck in” gift and it’s easy to design your own by choosing a special verse or saying and drawing it out on graph paper. I think this particular picture actually started with a kit, but after the first one, I just bought aida cloth and frames to make the rest. It’s a very inexpensive project… just your time and a couple of dollars for a frame, the thread, and the aida cloth… and yet the finished picture makes a wonderfully unique gift. That sure is pretty! My aunt used to cross stitch and everytime I see something like this it reminds me of her. I have to keep it in mind. This is very beautiful! The words are timely too, I just (like 2 minutes ago) found out my aunt died last night. These words are a comfort! Your stitched verse is beautiful! I have the Serenity Prayer in my to-do stash for the new year! I love cross stitching, especially verses. This is a good one! I was just thinking today that I need a few more little ornaments to tie to our Christmas packages and baskets. Now I know exactly what I’ll do! I love the cross-stitch!!! I enjoy doing cross-stitch as well although I have a number of different projects on the go (probably too many lol). The piece is just beautiful. I have some very dear friends that I would love to give this to them for Christmas. 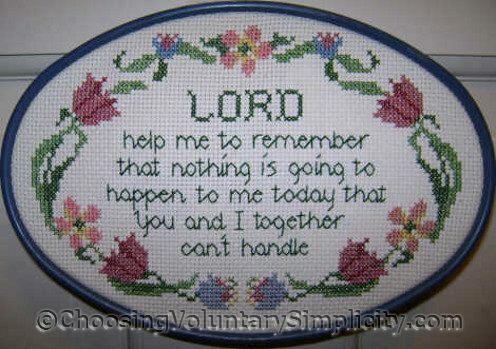 I love verses and cross stitch.